1.17.030 Number of Parking Spaces Required. 1.17.040 Parking Lot Lighting Required. 1.17.060 Maintenance of Parking Lots. The purpose of this Chapter is to reduce street congestion and traffic hazards in the City by incorporating adequate, attractively designed facilities for off-street parking and loading as an integral part of every use of land in the City. There shall be provided at the time of erection of any building or at the time any main building is enlarged or increased in capacity, minimum off-street parking space with adequate provisions of ingress and egress by standard sized automobiles as provided in this Chapter. 1. Standard Parking Space. Each standard parking space shall consist of a rectangular area not less than ten (10) feet wide and twenty (20) feet in length unless otherwise shown in Table 17.1. 2. Vertical Clearance. Each space shall have a vertical clearance of not less than seven and one-half (7½) feet. 3. Accessible Vehicle Spaces. Car parking spaces shall be eight (8) feet wide minimum and twenty (20) feet in length and van parking spaces shall be eleven (11) feet wide minimum, shall be marked to define the width, and shall have an adjacent access aisle of five (5) feet wide. Spaces shall be located near and convenient to a level or ramp entrance. Accessible parking spaces shall be signed and restricted for use by disabled persons only. Access Aisles shall be marked to discourage parking in them. Exception: Van parking spaces shall be permitted to be eight (8) feet wide minimum where the access aisle is eight (8) feet wide minimum. B. Parking Facility Design. 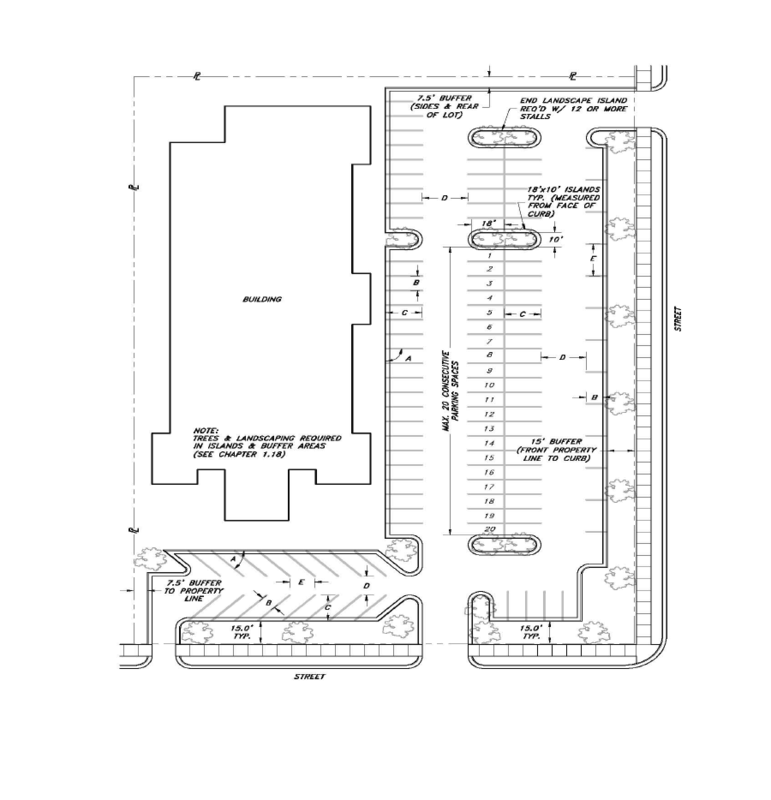 Each parking space shall have adequate drives, aisles, and turning and maneuvering areas for access and usability. Minimum parking design standards are defined in Table 17.1 and illustrated in Diagram 17.1. C. Street Improvements. Streets fronting off-street parking lot(s) shall be improved in accordance with Title II and Title III. D. All parking facilities shall be hard surfaced with asphalt, concrete or binder pavement materials. The materials shall be capable of handling the anticipated size and weight of vehicles, including public safety vehicles as approved by the City Engineer. E. Each parking lot shall be surrounded by a concrete curb, or other border approved by the City Engineer to ensure the life of the surface and to limit the access to approved ingress and egress. Business or Professional Offices 1 space for each 300 sq. ft. of gross floor area. Churches & Accessory Uses One space for each 4 seats in the chapel or main assembly area or if there are no fixed seats, then 1 space for each 100 sq. ft. of floor space used for assembly purposes. Dwellings 2 spaces for each dwelling unit. Plus .25 spaces per multi-family dwelling unit for visitor parking. Furniture, Appliance, Hardware, and Personal Service Shops 1 space for each 500 square feet of floor area. Hospitals 2 spaces for each bed. Hotels, Motels 1 space for each sleeping or dwelling unit. Food and Drink Establishments- on premises sale and consumption. Including Fast Food and similar dining 1 space for each 4 seats or 1 for each 100 square feet of floor area. Including outside seating. Retail Stores 1 space for each 300 square feet of floor area. Shopping Centers and Malls 1 space for each 250 sq. ft. of net floor area. Stadiums, Sports Arenas, and other Public Assembly 1 space for each 3 seats or 1 space for each 100 sq. ft. of floor area. Swimming Pools, Commercial and Public 1 space for each 10 persons based on capacity load. Theaters 1 space for each 3 seats based on design capacity of the structure. Wholesale, Warehouses, Manufacturing, and Industrial Uses As determined by Development Review Committee. But in no case less than one (1) space for each employee projected for the highest employment shift. All other uses not listed Uses not listed may be determined by the Development Review Committee based on type of use and similarity to other uses or City Engineer’s determination. A. Except for Single-Family Dwellings and Twin Home Dwellings, direct access to each parking space shall be from a parking lot access and not directly from a public street. All parking spaces shall have independent access not blocked by another parking space or other obstacle. Parking shall be designed to avoid backing onto a public street; Except for Single-Family Dwellings and Twin Home Dwellings and locations where the size or shape of the parcel is such that development would be precluded otherwise. 1. No more than two (2) driveways shall be used for each one-hundred (100) feet of frontage on any street. No two (2) of said driveways shall be closer to each other than twelve (12) feet. 2. On corner lots no driveway shall be closer to a street intersection from property line than twenty (20) feet. 1. No more than one (1) driveway shall be used for each eighty (80) feet of frontage on any street. And no driveway shall be closer to a side property line than six (6) feet. In cases where frontage is limited property owners are encouraged to share a common ingress and egress straddling the common property line. 2. Each driveway shall be not more than forty (40) feet wide, measured at right angles to the centerline of the driveway, except as increased by permissible curb return radii. The entire flare of any return radius shall fall within the right-of-way. 3. No driveway shall be closer to a street intersection than one hundred (100) feet. Depending upon the classification of the roads comprising the intersection and other factors the City Engineer may reduce the distance. 4. On State roads the City requires written evidence of UDOT consent to grant ingress and egress. ¹ Note: Multiple Uses. When a development contains multiple uses, more than one (1) parking requirement may be applied. ² Note: Fraction When Calculating. Any fraction obtained when calculating the parking requirement shall be required to add one (1) additional parking stall. The Development Review Committee may approve the joint use of a parking lot or facility provided that the applicant can show that conflict between the different users can be effectively eliminated. For instance, willing parties such as a church and a commercial business may share parking facilities if typical heavy use parking times allow. A copy of the recorded perpetual easement shall be provided to the Zoning Administrator. All parking lot light fixtures shall be installed to diminish light glare from adversely affecting adjacent properties. Pole mounted fixtures are required in lots or along roads. Lighting will be approved as to how adequately it provides for the health and safety of citizens. Design and location of standards and fixtures shall be specified on a Site Plan. Parking lots shall follow the requirements of Chapter 1.18 Landscaping, Buffering and Fencing Regulations. A. Less than twelve (12) Parking Stalls. Parking lots with twelve (12) total parking spaces or less are not required to install landscape islands. B. More than twelve (12) Parking Stalls, and no more than twenty (20) Total Parking Stalls. Parking lots with thirteen (13) total parking stalls or more, and no more than twenty (20) total parking stalls shall be required to provide landscape islands at the end of each parking row as described in section 1.17.045 C 1 and 2. 1. Islands on Single Rows of Parking. On single rows of parking there shall be one (1) eighteen (18) foot long by ten (10) foot wide landscaped island a minimum of every twenty (20) stalls, plus one (1) eighteen (18) foot long by ten (10) foot wide landscape island at each end of the parking rows. Islands shall be landscaped with a minimum of one (1) deciduous tree having a minimum trunk size of two (2) inches in caliper measured at ground level when planted and include other landscaping improvements such as grass, weed barriers, mulch, or ground covers. Landscape islands shall be irrigated to minimize water loss. No hard surface improvements such as concrete or asphalt are allowed within any landscaped islands. 2. Islands on Doubled Rows of Parking. On doubled rows of parking stalls, there shall be one (1) thirty-six (36) foot long by ten (10) foot wide landscaped island on each end of the parking rows, plus one (1) thirty-six (36) foot long by ten (10) foot wide landscaped island to be placed at minimum of every twenty (20) parking stalls. Each island on doubled parking rows shall include a minimum of two (2) deciduous trees having a minimum trunk size of two (2) inches in caliper measured at ground level when planted and include other landscaping improvements such as grass, weed barriers, mulch, or ground covers. Landscape islands shall be irrigated to minimize water loss. No hard surface improvements such as concrete or asphalt are allowed within any landscaped islands. 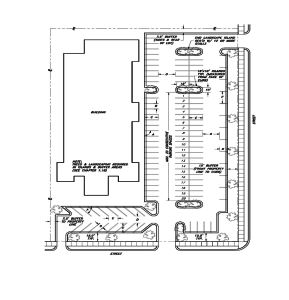 Parking lots shall be designed to comply with Section 1.18.035 Required Buffer Widths and Improvements. 1.17.055 STORM WATER. Storm Water generated from parking lots are required to comply with Title III General Public Works Construction Standards and Specifications Chapter 3.20 Storm Water Hydrology. A. Surfacing. Each off-street parking lot shall be surfaced with an asphalt or concrete or other binder pavement and permanently maintained so as to provide a dustless surface. Potholes, cracks, and other damage to the surface shall be repaired in a timely manner. B. Maintenance. All parking facilities shall be maintained and kept free of garbage and debris. Striping of parking stalls shall be kept in a manner that allows each stall to be identified. Parking lot landscaping shall be maintained.